The Ranger Manual Tyre Changer handles 203 mm to 191 mm x 406 mm tyres for faster, easier manual wheel service in any home garage or professional shop. An incredibly efficient and portable tyre changing system, the RWS-3TC is an absolute necessity for any tyre shop. 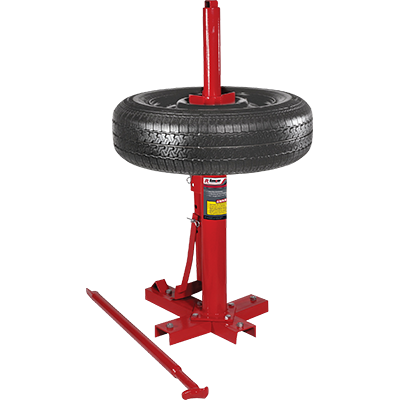 Ideal for professional use or at home in the garage, the manual tyre changer performs both mounting and bead breaking procedures at a fraction of the normal cost. Heavy steel construction combined with portability and easy operation makes the Ranger manual tyre changer the in-class leader and service professional’s first choice. Move it anywhere with zero struggle or strain. “Manual” doesn’t mean difficult. The bead breaking system on this tool is effective on smaller tyre sizes (up to light truck), and mounting is made easy for ergonomic convenience. Take this tyre changer with you anywhere: on the road, to your buddy’s, to and from the shop, etc. With the time and money you save, you’ll be glad you went with this timeless piece of shop equipment.